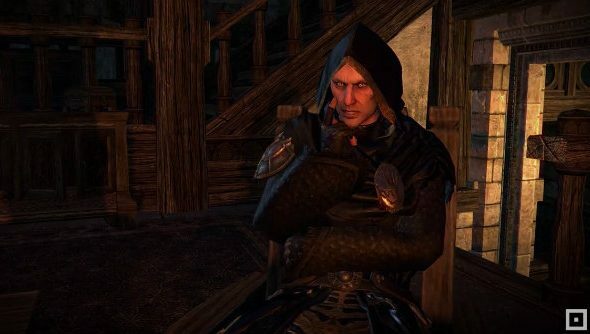 Bethesda have given us a first glimpse at what life will be like in TES Online for members of the underground assassination guild, The Dark Brotherhood. The Dark Brotherhood expansion isn’t out yet, but you can try the game in our list of PC’s best MMORPGs in the meantime. Of all the questlines in all the Elder Scrolls games, it’s The Dark Brotherhood that I enjoy the most. There’s something about taking out your target stealthily in Bethesda’s sandboxes that just feels right, and the missions themselves are usually varied enough to stay interesting right through to the end. I’ll be watching TES Online to see if the developer can capture that same magic in a universe shared with thousands of other players doing the same. Though it’s only a small taste, the new trailer makes it look like you just sneak up on town guards, for some reason. Well, Assassin’s Creed pulls it off. Personally, I want something on the scale of ‘Whodunit?’, Oblivion’s murder mystery party where you’re tasked with picking off the guests one at a time. In fact, I’d take a full game of The Dark Brotherhood if it had more missions like that.